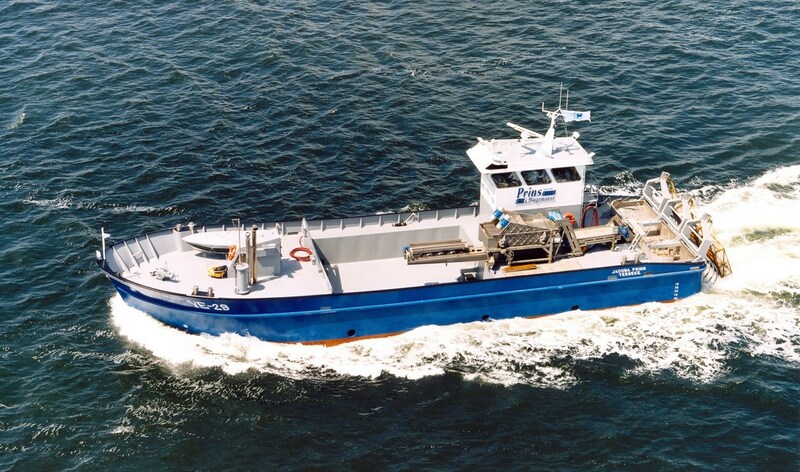 Home › Fishing Vessels › Shellfish Dredger › Oyster Dredger 2908 › Oyster Dredger 2908 "Jacoba Prins"
On the 30st of June 2005 Maaskant Bruinisse B.V. handed over the very innovating oyster dredger to Prins Oesterkweek b.v. Prins Oesterkweek b.v. is part of the well-known Prins & Dingemanse from Yerseke. The vessel with yardnumber 588 " Jacoba Prins " is registered as YE-29 at Yerseke. She is provided with the new fishing system over the stern, developed by Maaskant Bruinisse ( patent pending). What’ s also unique is that the vessel is completely diesel-electric. The propulsion consists of two electrically driven rudder propellers, self steering 360 degrees.